The man with the hat, the silly grin, the little legs and the pointy stick is here, and this time he's brought his gun. Stamp collector and part-time explorer Rick was searching for the lost Goolu tribe when he crashed his plane in the Amazon. He was grabbed by the Goolus and taken to their temple from which he must now escape. This side-on viewed platform game is full of puzzles, timing problems, nasty tricks and... fun. Armed only with six-shooter, a fistful of dynamite and a pointy stick, Rick works his way through the temple collecting treasure for points and either avoiding or destroying the Goolu guards. Most of the guards follow strict patrol paths, so it's often just a timing problem, but some guards who 'home in' on Rick can be a little trickier to dispose of. Fortunately, guards only prove deadly if you actually touch them, in which case you lose on of an initial six lives. Most can be disposed of from a distance, but ammunition is limited and boxes with fresh supplies are few and far between. If you should run out of bullets, you can always use the dynamite, though this is best saved for blowing up blocks that conceal secret tunnels and piles of rubble that obstruct the path. Nothing can be taken for granted on the trek through the temple. Get too close to some blocks and nasty spikes spring out; move too slowly along a platform and nasty stone heads spit spears; jump too late or too early over a chasm and you'll fall to the bottom of a spike-covered pit. 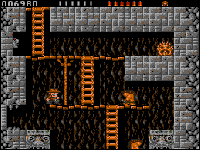 Nine times out of ten you'll be killed by an entirely unforseeable trap, but with progress further into the game you'll start to recognise the danger signs and learn to take evasive action where and when necessary. The temple is large, but with several restart points so you don't need to go all the way through it every time. Rick's next adventure is in an Egyptian pyramid where things are similar if slightly more puzzleoriented. A final expedition takes Rick to an enemy fortress, which is very tricky to negotiate. For an old-style platform game, Rick D is fun to play. The puzzles are tricky and the gameplay is very satisfying. With lots of trial and error and a bit of concentration you'll solve each puzzle eventually, and have lots of fun along the way. It's an old game style so don't expect stunning 3D; the backgrounds are all very nicely drawn, though, and the sprites are great. The animation is fine too and the sound effects are nice but nothing spectacular. A fun game that will take you a while to complete, but it's addictive enough to keep you trying. 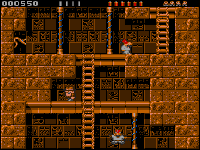 Tony Dillon gave the C64 version of Rick Dangerous a well-deserved 84% a couple of months ago, and the Amiga version is, fortunately, every bit as good as the earlier incarnation. The gameplay is practically the same in this flip screen arcade adventure, but obviously the sound and graphics have been enhanced. There is an atmospheric little tune at the start of the game, and brilliant spot noises, including a fantastic gunshot and scream sound every time you shoot someone. The graphics build on the strength of the 64 version, with highly detailed and attractively coloured screens throughout. My only complaint is that it might have been possible to introduce decent scrolling on the Amiga, as opposed to the pseudo-flip screen effect on the 64, but this aside, it is in every way a worthy successor to the 64 version.